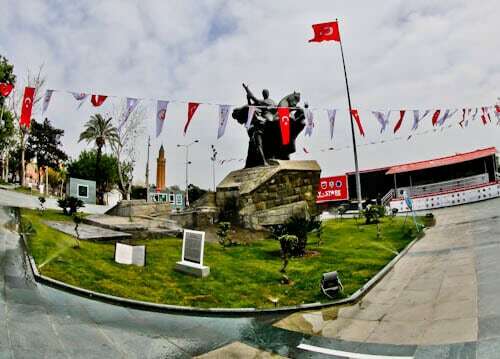 Hotels in Antalya are excellent value, I recommend you choose one in the old town. 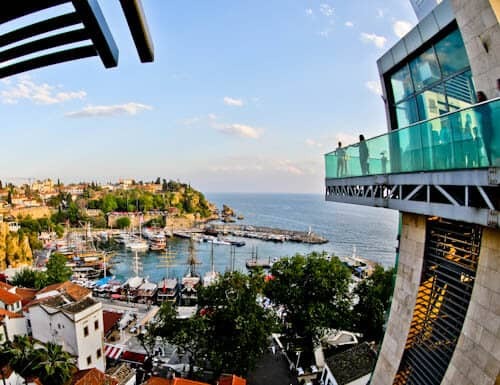 I stayed in Patron Boutique Hotel which offers panoramic views over the old town and bay. 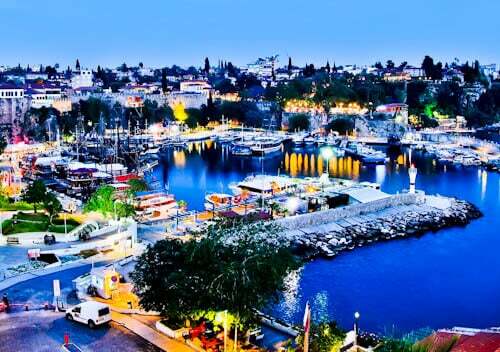 The postcard perfect location in Antalya is the Marina. It’s unique because it has the ancient city walls as a backdrop. 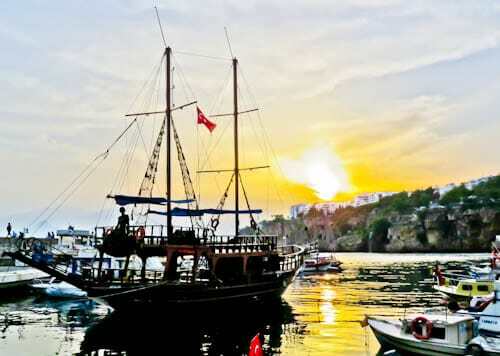 Additionally, the marina is a wonderful sunset location in Antalya. Finally, this is the set off point for many Antalya boat tours. One of the best marina viewpoints comes from the panoramic elevator. As well as a viewing platform, it’s also a glass elevator which takes you to the lower level. Alternatively, you can walk up and down to the marina, however, the elevator is a free service. Did you know there’s a similar but more historic elevator in nearby Izmir, Turkey? It’s possible to take a boat trip or cruise from Antalya marina. Popular destinations include the surrounding canyons, caves and waterfalls. Alternatively, you can find a shorter cruise into the bay to enjoy sunset. Lastly, some of the boats are of the viking and pirate ship genre. 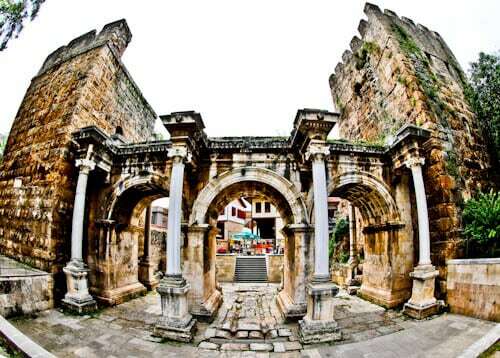 Hadrian’s Gate is the last remaining gate to the old city of Antalya. As a matter of fact, this 2000 year old structure is a triumphal arch. It was built in honor of Roman Emperor, Hadrian who visited in 130 AD. For this reason, you are walking in the footsteps of a Roman Emperor when you explore Hadrian’s Gate. Did you know there’s also a temple dedicated to Hadrian in both Ephesus as well as ancient Rome? At the entrance to Antalya old town is the huge Clock Tower. An interesting fact is that the ancient walls once featured over 80 towers. The Clock Tower is the last remaining tower. It’s a reminder of the great ancient city Antalya was. So great, that Roman Emperor Hadrian made a visit during his reign. 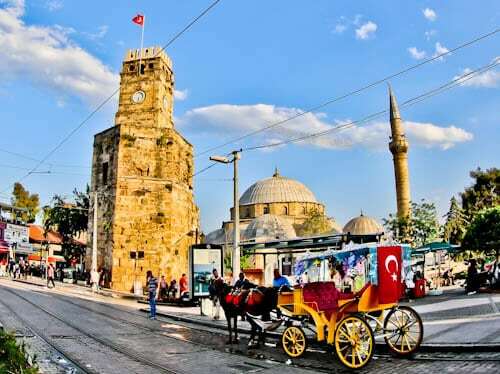 Adjacent to the Clock Tower is an Ottoman mosque which is a reminder of another era. Don’t be afraid to go inside but respect the dress code and avoid prayer time. A photo with the Antalya sign is always a good reminder of your trip. It’s adjacent to the Clock Tower. You’ll see many historic trams as you explore Antalya. These are known as nostalgia trams and are in fact, imported from The Netherlands. 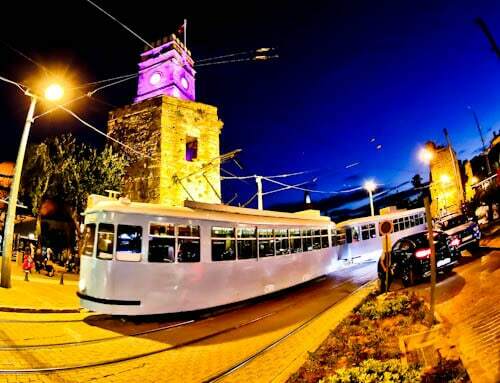 Historic trams are always photogenic and seriously enhance your Antalya photography. Lastly, they run every half hour from near Hadrian’s Gate all the way along the promenade to Antalya museum. 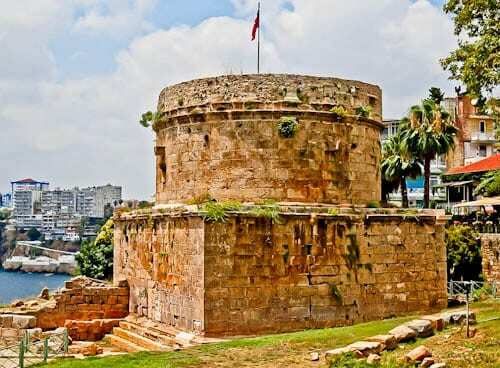 Hidirlik Tower is an old stone tower built during Roman times. It’s unknown what the towers purpose was. Maybe it was a tomb of an important person. Alternatively, it could have been a lighthouse, fortification or even a church. Nonetheless, it offers beautiful views over the bay. Adjacent to the tower is Karaalioglu Park. 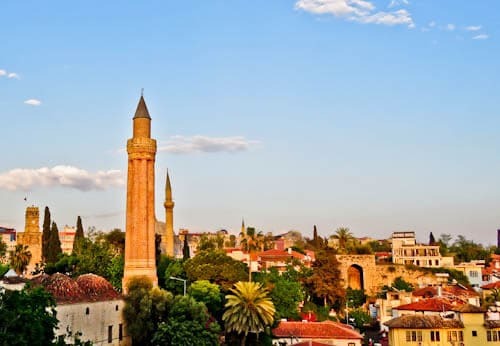 A prominent landmark of the Antalya skyline is the Fluted Minaret. It’s part of the Yivli Minare Mosque, built by Kayqubad I. In addition, it’s one of the oldest examples of Seljuk architecture in Antalya. You’ll pass many shops selling Turkish souvenirs as you walk around Old Town Antalya. Foodies will love the endless food and drink options. Furthermore, there are random remains of ancient fortifications spread throughout old town. 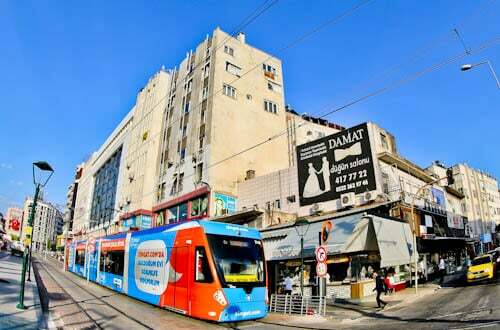 I mentioned the historic tramway and Antalya also has a modern tramway. This runs throughout the new town including the airport and bus station. It’s incredibly convenient for independent travel in Antalya. Finally, you’ll get a better idea how life in Antalya truly is if you visit the non touristy new town. Again, foodies will love the food and drink options in new town. 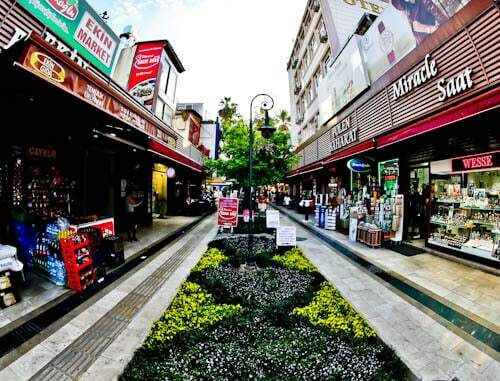 Antalya has a beautiful promenade walk from the old town to the Antalya museum. As a matter of fact, you can continue further towards the beaches if you wish. You’ll pass many restaurants, tea stalls, sea views as well as monuments and parks along this route. An alternative would be to take the historic tram along this route. If there’s only one museum you visit in Antalya, I recommend the Antalya Museum. It is in fact one of the largest museums in the whole of Turkey. I expect you’ll visit Hadrian’s Gate in the old town. To complement this you can also view Hadrian’s Statue in the museum. In total there are over 7000 square meters of historic artefacts to view. 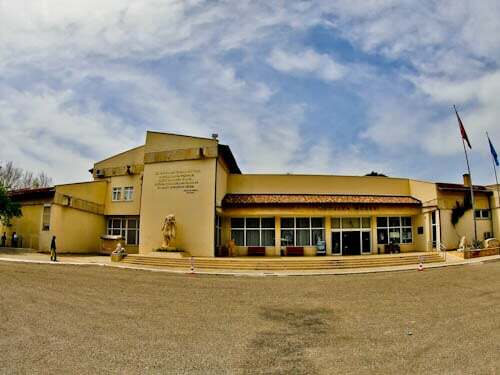 For the latest exhibitions, prices and opening times, visit the Antalya Museum website. Antalya is home to Turkish Super League side, Antalyaspor. They have a state of the art stadium to complement their position in the Super League. As a matter of fact, it’s considered to be one of the most eco friendly stadiums in the world. It’s roof features over 5600 solar panels to power the stadium. 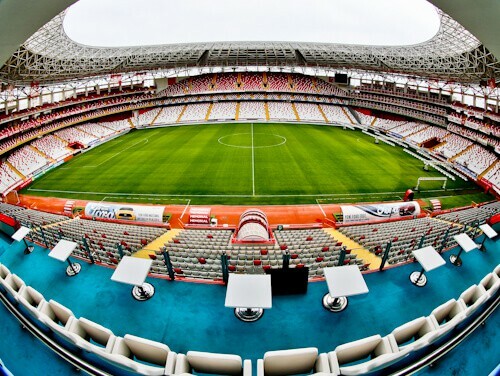 Read about my Antalyaspor stadium tour on my Turkey travel blog. The Antalya Cable Car is known in Turkish as the Tunektepe Teleferik. Do you want a panoramic view of Antalya, the beaches and bay? Then you must take a taxi out to the cable car. Pamukkale is not only a UNESCO site but also one of the most photogenic places in the world. 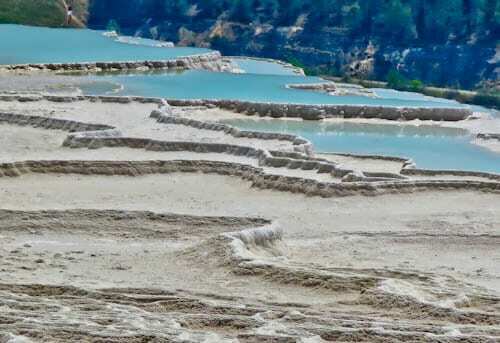 Thermal water running down travertine terraces has created an incredible view. Photographers and those who pose for Instagram pictures will be in their element here. 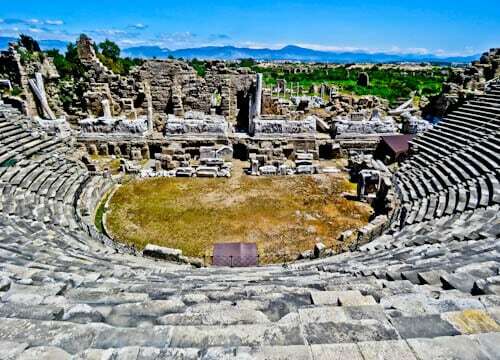 Additionally, adjacent to the travertine terraces is the ancient city of Hierapolis which features a huge amphitheater. Finally, it’s possible to visit Pamukkale on a day trip from Antalya. 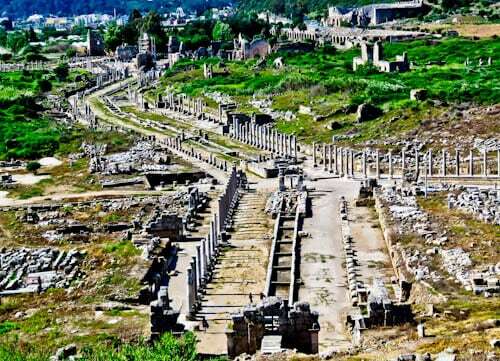 The ancient city of Perge is just 15 km east of Antalya. In my opinion, Perge is as impressive as Ephesus but without the hordes of tourists. As a matter of fact, I sat alone in the amphitheater for 30 minutes without another tourist in sight! For this reason, Perge is both a peaceful and enjoyable experience. Lastly, you can visit Perge on a combined day trip with Side and Aspendos. The city of Side lies 75 km east of Antalya. It’s a unique coastal town which is surrounded by Greco Roman ruins. In addition, there’s a huge amphitheater to explore. From the amphitheater you can walk through the towns main street to the coast. The main street is lined with restaurants and shops. Once you reach the coast you can admire the ruins of Apollo’s Temple. Lastly, you can visit Side on a day trip with Perge and Aspendos. 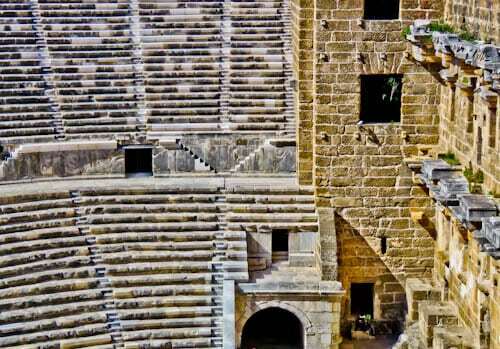 Aspendos is one of the most complete theaters you’ll see anywhere in the world. Albeit restored, it’s incredible to see not only the amphitheater but also the grand caravanserai area. Additionally, there’s an interesting Roman aqueduct nearby. Something noteworthy about the aqueduct is that the locals wait for tourists and sell them incredibly cheap freshly squeezed orange juice. The easiest way to visit Aspendos is on a combined day trip with Side and Perge. 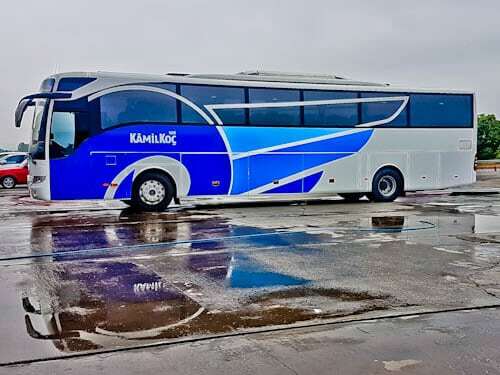 There are several buses a day between Antalya and Konya. They leave almost every 30 minutes from Antalya Otogar. 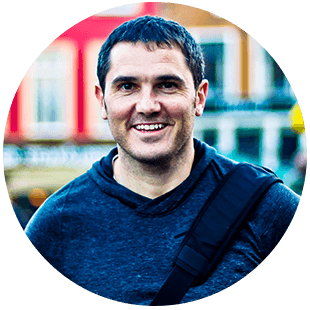 As a result, you can simply turn up and buy the next bus service to Konya. 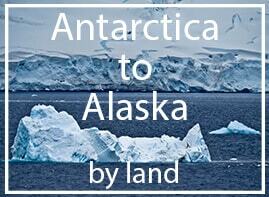 The journey takes around 5-6 hours and includes snacks and drinks. Enjoy the ride!